As a user of Slack, you’re organized, you’re on the ball, and you’re well connected to your team. Every once in a while though, something falls through the cracks and you forget a meeting. Or you didn’t know the meeting location, or the time changed, and that messed up your whole day. Luckily, a flub like this could soon become a thing of the past. Slack’s new integration with Google Calendar allows for any calendar (even on multiple Google accounts) to post to any channel, as well as privately to yourself (via @slackbot). You can set custom reminders before events, get a daily digest each morning and a weekly digest on a day/time of your choosing. Does your company have a shared calendar for the Marketing team? Send reminders to your #marketing channel 15 minutes before every weekly status meeting so everyone’s on board. Do you schedule a one-on-one with your boss every Tuesday? 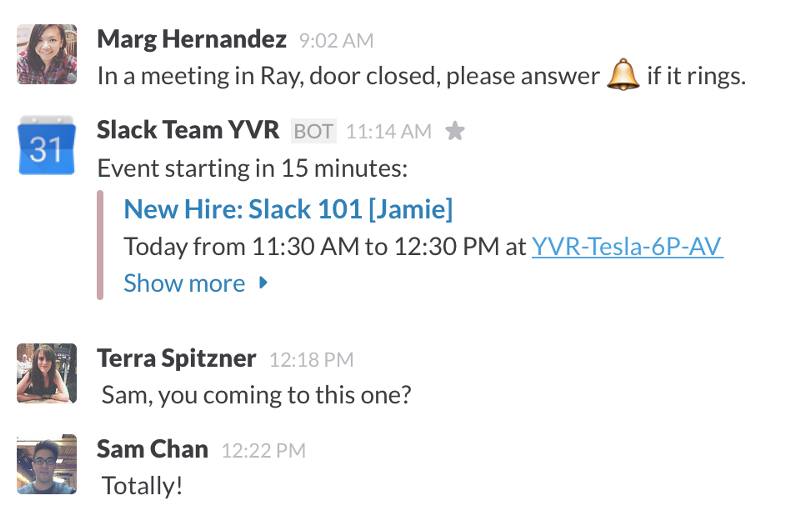 Your daily 9am calendar reminder in @slackbot will ensure you won’t show up unprepared. Set the company-wide Birthday and Holiday calendar to auto-post in your #office channel and get your celebration emoji ready every morning. Combining Google Calendar and Slack is quick and easy. Choose the Google Calendar option on your team’s Integrations page. 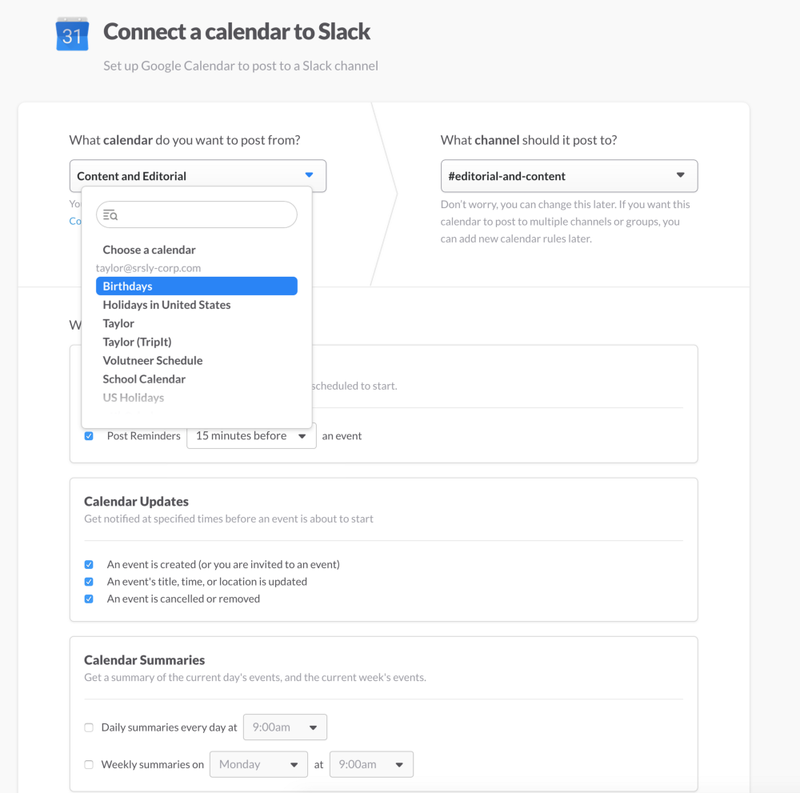 Connect a Google account to Slack to choose from a list of calendars. You can add multiple Google accounts (personal and work-related) to access more calendars. Choose from any calendar associated with your Google accounts and pick which Slack channel you’d like Google Calendar to post to. Customize options for your new rule. The default event reminders can be adjusted or disabled. Calendar updates can also be disabled and you can optionally enable daily and weekly summaries at times and on days that work best for you. Save the Integration to complete the process. To add more calendar reminders (holidays, travel, meetings, volunteer organizations, school events), repeat the process to add additional Google Calendar notifications to your own (@slackbot) or shared channels. Once everything is configured, calendar messages will appear in channels at times you’ve specified and team members can interact with them directly by expanding or following links to Google Calendar event pages for additional options.